Etisalat ranked no. 2 on the Forbes Middle East list of “ top 50 public companies in UAE “ based on four major criteria of total assets, net profits, market capitalisation and revenues. 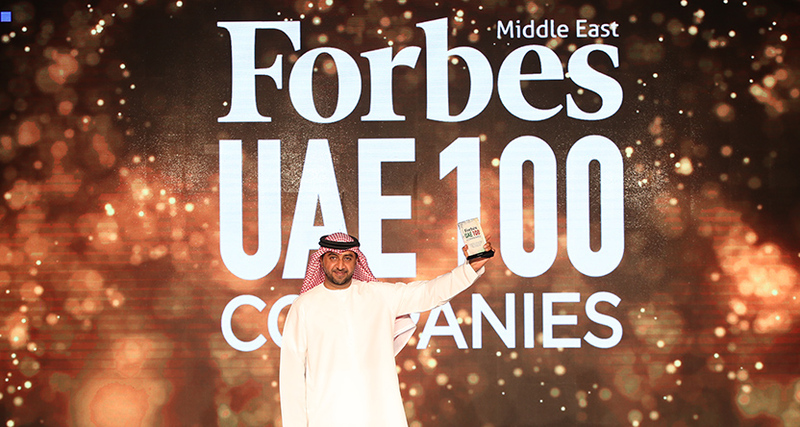 With its first UAE 100 ranking, Forbes Middle East (ME) recognised 100 companies that have played a key role in making the country the thriving business center that it is today. The 50 of the biggest companies are listed on the country’s main stock exchanges and are some of the largest and most valuable companies in the country. Etisalat today is the ‘Most Valuable Telecoms Brand’ in Middle East and North Africa region by Brand Finance in recognition of the company’s increase in brand value by 40 percent to $7.7bn-higher than any other telecom brand in the region and the only telecom provider to break the $7bn brand value mark in the region. Etisalat is the only telecom provider from the region to feature in the top 15 most powerful telecom brands globally and boast of an impressive AAA brand rating. On a portfolio basis, the brand value inclusive of non-branded subsidiaries (Mobily in KSA, Maroc Telecom Operations, Ufone/PTCL in Pakistan) has jumped by 25 percent to $9.6bn. Khuloud Al Amyan, Editor-in-Chief Forbes Middle East, said: “UAE today is a preferred regional business hub with over 90 percent of the companies featuring on the Forbes Global 2000 list basing their regional headquarters in the country. With infrastructure rivaling those from some of the most developed economies, it is also a hub for regional trade.